Hi there! We have loads of amazing inspiration coming your way over the next few days! 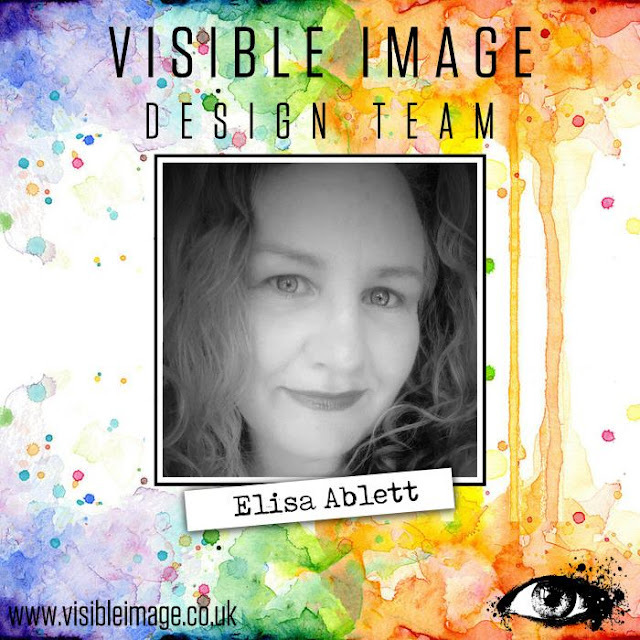 Hello everyone it’s Visible Image day again! Today’s piece was briefly shared on the day of the 2018 new stamp launch in early January. It’s also been lucky enough to travel to Creativation! Time now to share it in a little more detail. 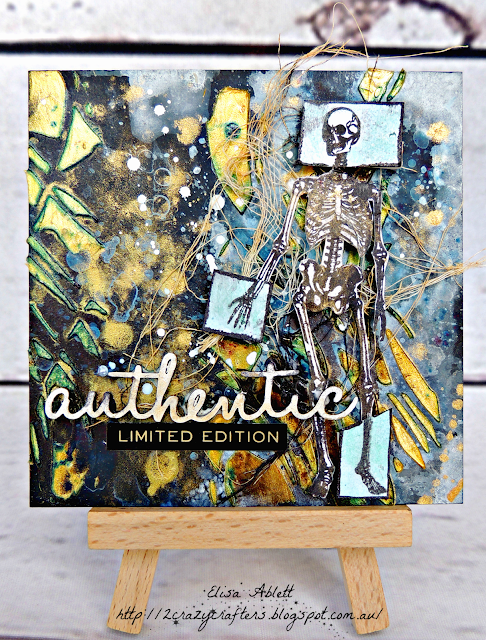 To create the piece the baby image was heat embossed in black on to watercolour card and then masked using masking fluid. 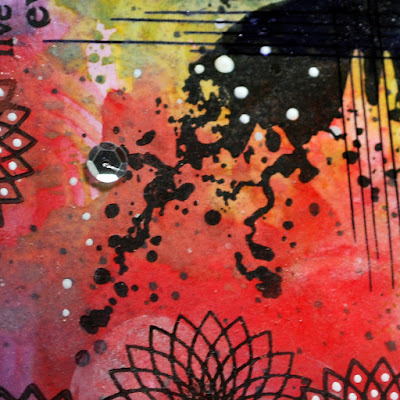 The background was sprayed using a mixture of ink sprays including mica sprays. I wanted the area around the image to be bright and to gradually darken into a mix of colours. 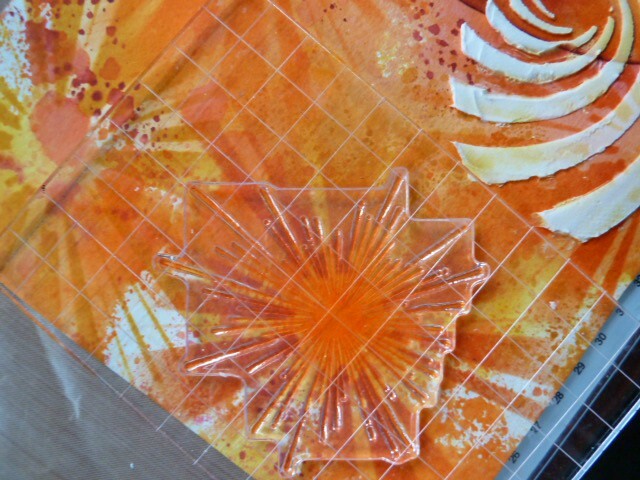 I used a bright yellow acrylic ink for the centre. I liked the textures created by the sprays. The finger print was stamped in black and then again using stamping glue. Gilding flakes were added on top. It wasn’t entirely successful but from certain angles the gold flecks shine through. To create the roots I selected two elements from the other sets. These, along with the leaves and ‘love’ sentiment were heat embossed in black. I also sprinkled some granules of black embossing power either side of the image to create more texture. 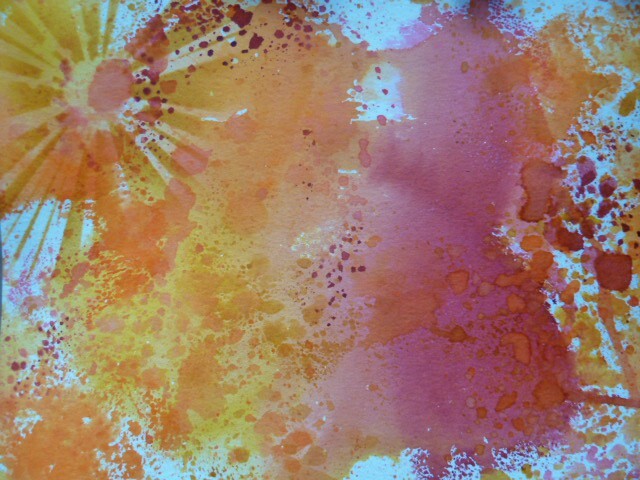 The masking fluid was removed and the flower in the centre coloured pink. 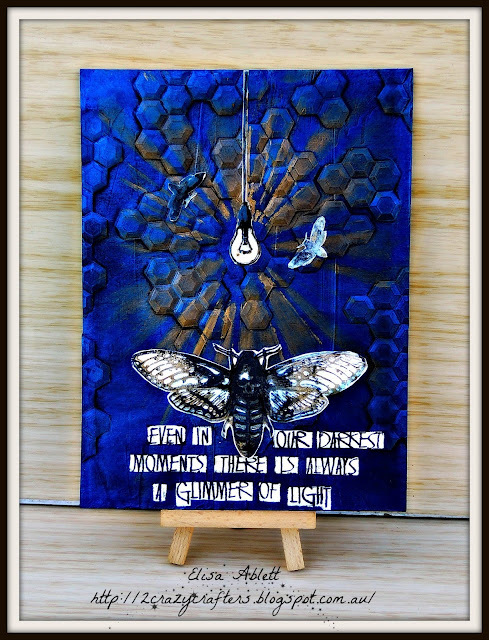 I blended distress oxide ink in blue and black around the edges. Some extra aqua tint ink in gold and black was flicked for good measure! The artwork was mounted onto complimentary card. 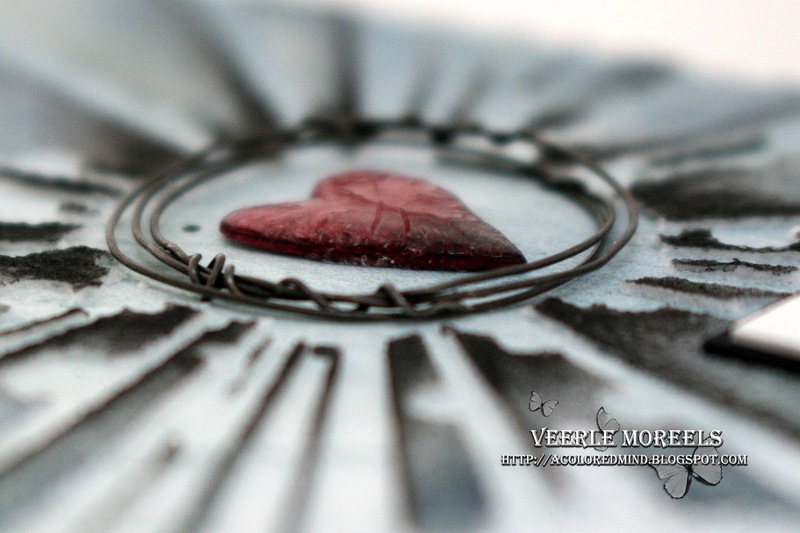 The sentiment stamped, inked and mounted underneath as the final touch. A little different I think you will agree! I recommend these stamps. Lovely quality and very versatile. Absolutely stunning plaque Lisa! We loved showing it off on our stand at Creativation! We will be back later with more inspiration from our awesome team! Hello there! Firstly let us apologise for neglecting our blog for the past few weeks.. Creativation was AMAZING for us! We met so fantastic people, and we had so many orders from fabulous stores in the USA, Canada, Denmark and even Australia while we were there! Sadly when we got back to the UK we were both struck down with a very nasty flu, which literally knocked us off our feet for a week! So between that and packaging all the orders, we have had little time for anything else..
We love how our walls turned out! Mark remembered to pack his spirit level!! Hands up if you LOVE these stamps! Our colourful corner of the very large hall ! We were incredibly proud of our stand! We’ll be back very soon with the first of many incredible projects created with our NEW stamps! Facebook PAGE … give us a like and enter our weekly giveaways! 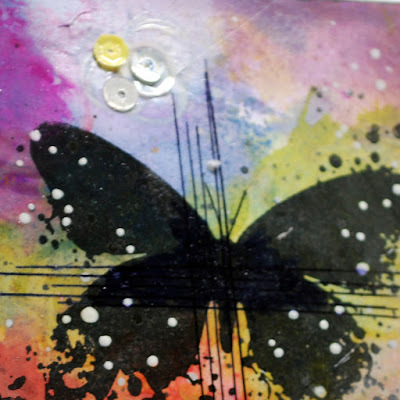 If you have been creating with our stamps or stencils, don’t forget to tag us in your posts! Hello! We are back with more fabulous inspiration this evening! 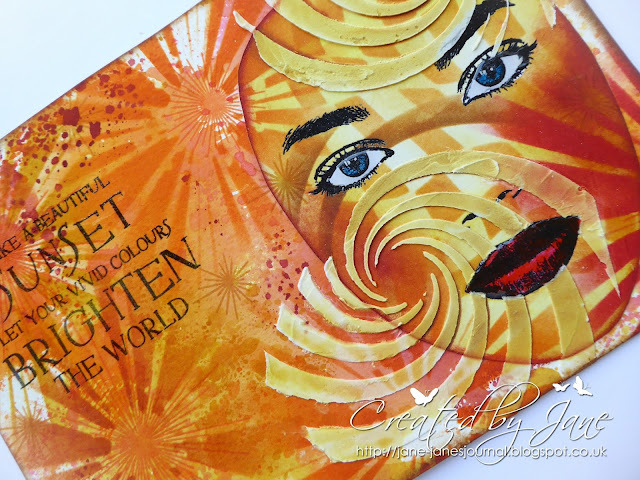 Heather Mitchell has been creating THE most gorgeous texture..
How is everyone doing? As I write this it’s a ridiculously miserable day, dark, drizzly, windy and chilly and just the sort of day I want to tuck myself up in a duvet… however, my new make for Visible Image definitely blows away the cobwebs! The tag is made from 300gsm watercolour paper, this way I knew it would soak up the colour well. 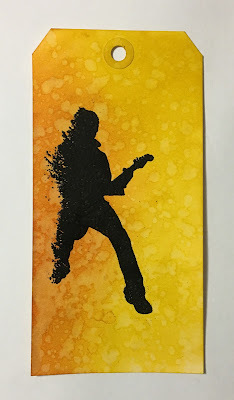 I’ve used modelling paste through the stencil and allowed it to dry overnight. I’ve then used various Distress Ink Sprays to drip colour from the middle and pour it down the strobes but I haven’t sprayed the ink, I removed the top and used a pipette to gulp up the ink and then drip. 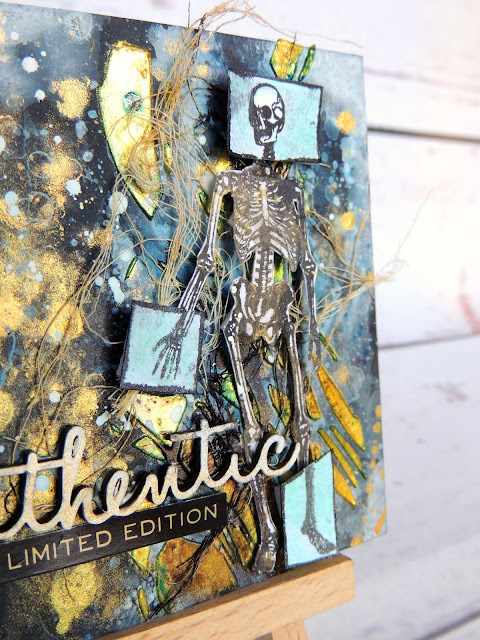 I wasn’t entirely happy with my tag at this point and felt it needed yet more colour so I dabbed some Distress Oxides on my craft mat, sprayed with water and then dipped the tag in the ink. 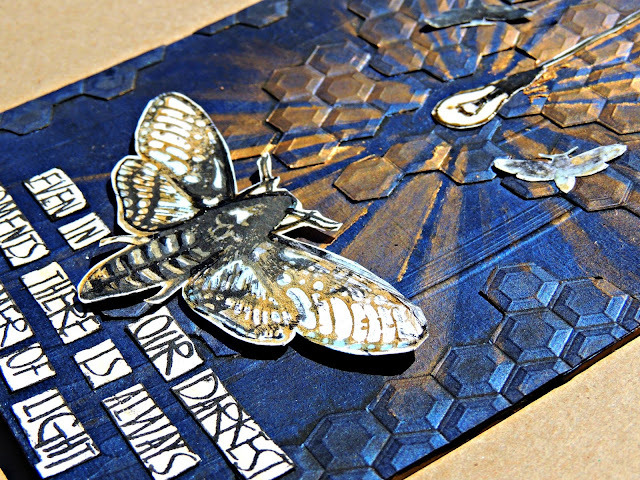 To add a little sparkle, I’ve added splash of gold spritzing ink, which you can see glowing nicely in the photo above! As the background is so vibrant, I kept the detail simple and used just one of the fabulous Origami boat’s from Destination Unknown set held in place using 3D foam dots over some fibres that I’ve stapled down. There are a few droplets of Liquid Glass on their too which adds a lovely different texture. The sentiments have been stamped on white card and I’ve distressed the edges using Distress Ink pads before matting them onto black card. To finish, I’ve threaded some bright pink and red ribbon through the punched hole which echoes the colours perfectly. And there you go! This make is a definite keeper… you know, those projects you make that you can’t bear to give away and you just get out to look at lovingly now and again! Hehe! Thank you for looking and hope to see you next time! Superb tag Heather! 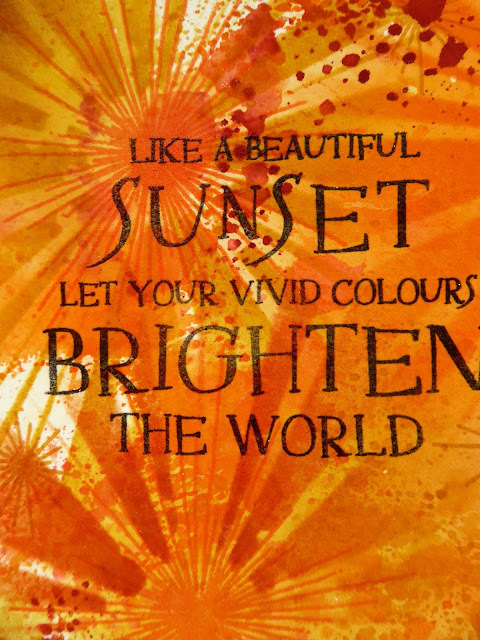 LOVE it.. the colours are stunning and that texture is wonderful! We will be back later with another stunner from Lisa Taggart! Hello! So sorry we have missed a few days posts.. it’s all been a bit crazy with the Black Friday SALE.. website crash (BIG thank you to Patrick for getting it back online quickly!).. and this weekend we have been moving into our fabulous new premises too! Photos soon!!! Hi there. 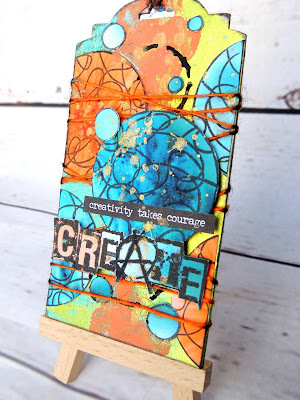 I’m popping on here today to share a fun tag that I made with my Visible Image stamps. I don’t usually make tags but when I do, I completely cover the tag with layers of ink. I love all the rich, warm colours on this one. Stamp the profile image and words (links to the stamps are below) with clear Versamark ink and heat emboss with white embossing powder. 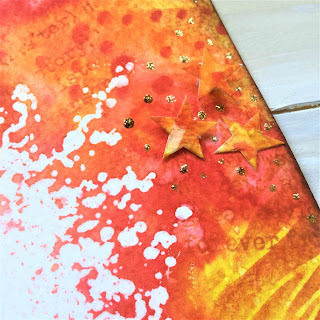 TIP: Be sure to choose the smoother side of the water colour paper for stamping. If you choose the bumpy side it is difficult to get a full image. Wet the watercolour card and pounce distress stains randomly on the card. Whilst drying spritz with some water droplets. 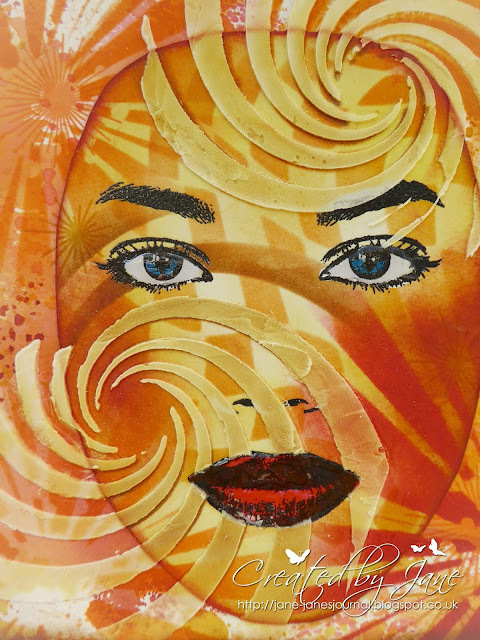 Using the Cosmic Skies stencil, brush through it with carved pumpkin (on the yellow parts) and candied apple (on the orange parts) around the face image. Next brush through the Fibres stencil with rusty hinge distress ink. 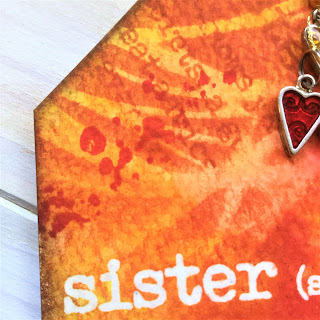 Then randomly add parts of the Sister Definition words inked up in rusty hinge distress ink, and random bits of the splodgy parts of the face image in candied apple distress ink. 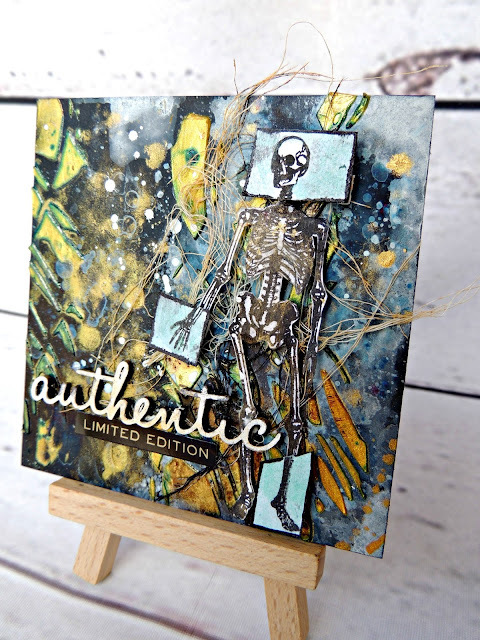 Cut the embossed part of the inked watercolour card into a tag shape and blend vintage photo distress ink around the edges. Add co-coordinating coloured ribbons and 3 co-ordinating heart charms. 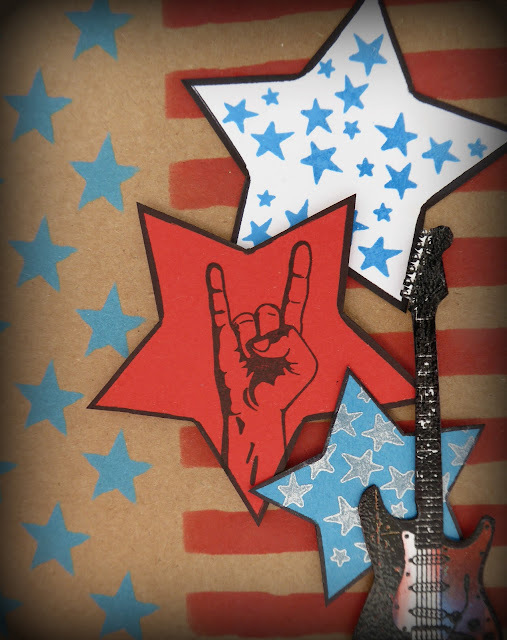 On the leftover pieces of inked watercolour card, draw round some stars from the Stars and Stripes stencil and fussy cut them. 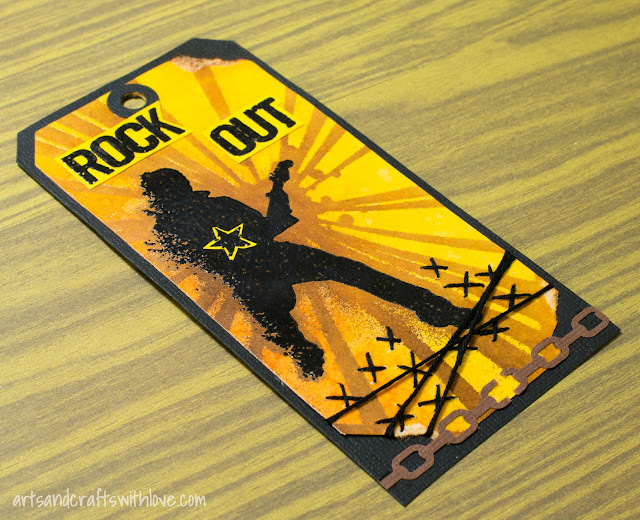 Add the cut out stars to the tag using varying heights of 3d foam pads. 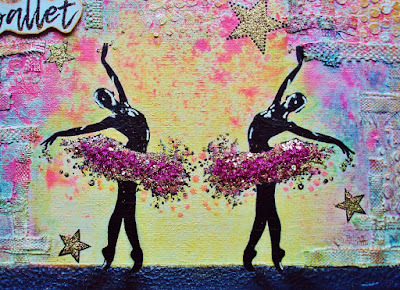 The final touch is to dot gold stickles around the areas of stars. Watercolour Card, Ribbons, Charms, Versamark clear ink, Wow! 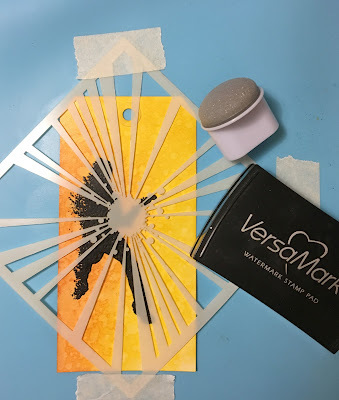 ultra bright white embossing powder, Gold Stickles, Distress spritzer, Distress Stains (mustard seed, carved pumpkin, candied apple) Distress Inks (carved pumpkin, rusty hinge, candied apple, vintage photo). 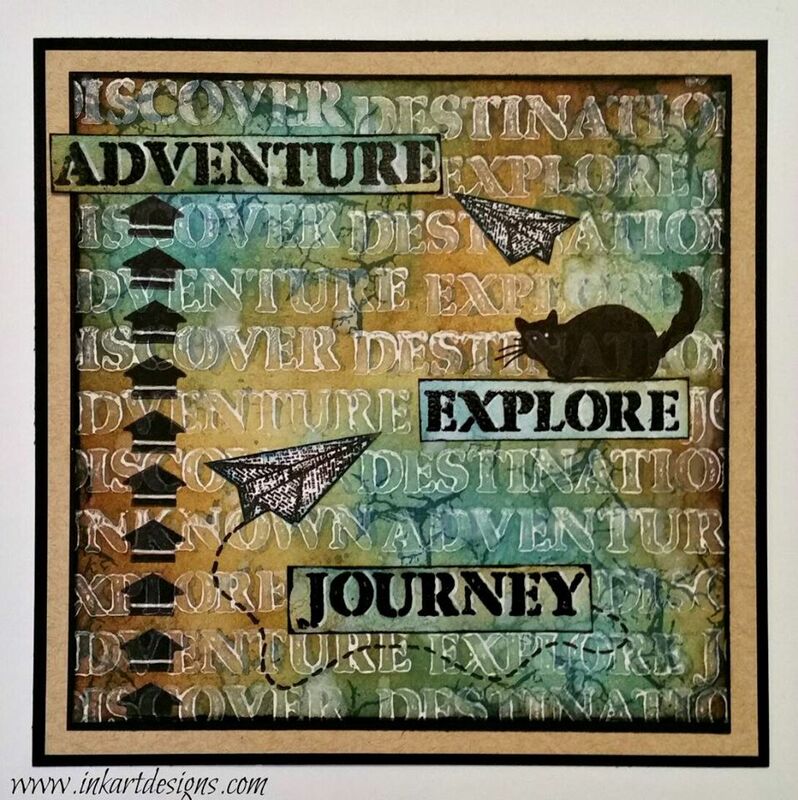 I hope you like this tag and are inspired to make one of your own. Thanks for stopping by and we really hope to see you again soon. We will be back tomorrow with gorgeous inspiration from Pauline Butcher and Josefine Fouarge. Destination Unknown is one of the fun new releases from Visible Image. 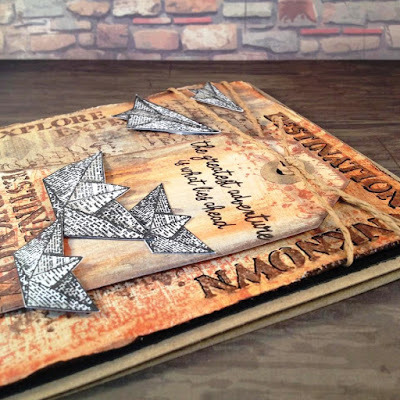 The paper boats and planes reminded me of so many fun times as a kid… and even now seeing as I work at a school! 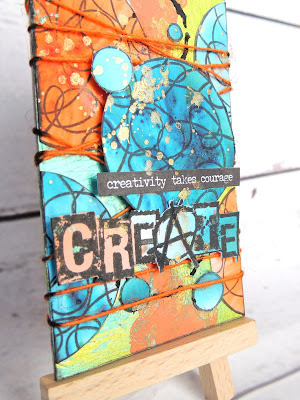 Gee, how much fun was it to see Visible Image back on Create & Craft? The time difference fitted perfectly for me so I was able to watch it too. This set has so many words to choose from that would be handy for a wide range of projects. 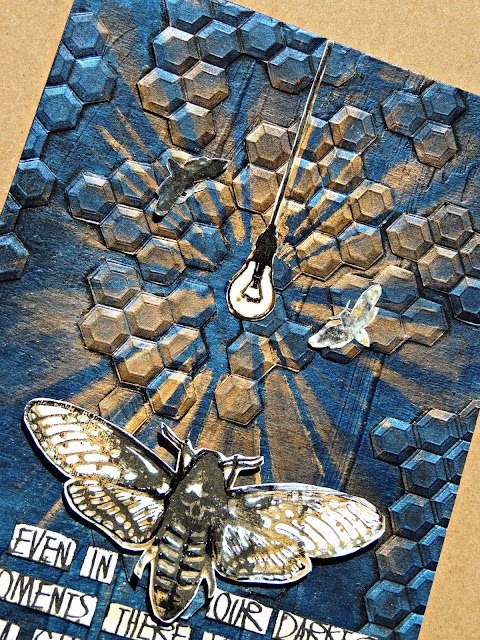 So words, all of them, became the backdrop for this card! The words were stamped with picket fence distress paint and then gone over with distress inks… with some shadowing added. The arrows were added to represent Adventure. The cat from Create It represents Explore. And the paper planes represent Journey. The paper planes come in three sizes with is an added bonus too! What an awesome card! Thank you Dot ♡ Loving the background.. there are just so many possibilities with this set, it is a must have! Coming up next we have some stunning Face it inspiration from Jane!